This new laser technology is only available in a few centres in Australia including Gosford Private Hospital where this is used by the accredited Urologists at this institution. 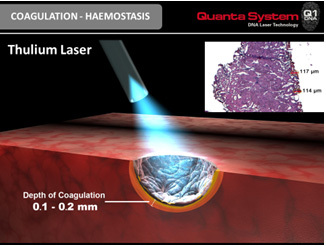 The Quanta System DNA Laser Technology is a powerful, efficient, high precision thulium laser. It is a versatile laser that is able to resect (enucleate) and vaporise prostatic tissue. Dr Louie-Johnsun attended a live operative workshop on this surgical technique at San Donato University Hospital in Milan, Italy by one of the pioneers, Professor Carmignani as part of the European Association of Urology (EAU) Conference. Further information and videos from Quanta System are provided below. The powerful 150-watt Cyber TmX thulium laser provides the ideal blend of high-efficiency cutting and effective coagulating effects, making it an ideal prostate laser instrument. Many of the risks associated with other laser wavelengths are minimised and/or avoided with the Cyber TmX. For cutting and vaporising speed the powerful Cyber TmX has no competitor. Compared with holmium lasers, the Cyber TmX wavelength is absorbed by the tissues 2.5 times more efficiently, and compared with green-light lasers or other lower-powered thulium lasers, the Cyber TmX will reduce vaporisation time by 40% . 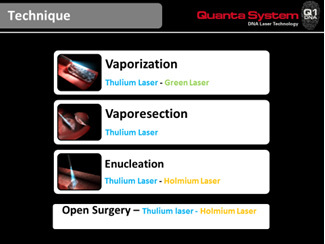 Due to the cutting characteristics and available laser fibres that the Cyber TmX offers, the surgeon has the option of vaporisation, or vaporesection™ , which allows for the selection of the optimal approach. Only the 150-watt Cyber TmX does it all. Most lasers are used to either vaporise or resect tissue, but The Cyber TmX can both vaporise and resect tissue. In prostate surgery for example, a surgeon may wish to vaporise smaller glands and resect larger prostates to reduce treatment time or obtain tissue samples for pathological evaluation. Although the Cyber TmX is unsurpassed for prostate surgery, it is also a highly versatile surgical laser for many other surgical procedures, including; bladder neck incision, opening strictures, vaporisation or excision of bladder tumours and partial nephrectomies, just to name a few. The Cyber TmX combines the cutting efficiencies of a CO2 laser with the haemostatic properties of a holmium laser, making it a perfect multi-application laser across a range of clinical applications. Since 2-micron laser energy is absorbed primarily by water which is ubiquitous in all tissue, the speed of cutting and vaporising will remain relatively constant regardless of tissue vascularisation. Energy from the Cyber TmX travels only two-millimetres beyond the fibre tip in water and penetrates tissue less than one-millimetre providing the surgeon with a high degree of control over the energy delivery. The UroLift® System treatment is a minimally invasive approach to treating prostate enlargement and symptoms by lifting the enlarged prostate tissue out of the way so it no longer blocks the urethra. There is no cutting, heating or removal of prostate tissue.